Click here for a printable map with info! 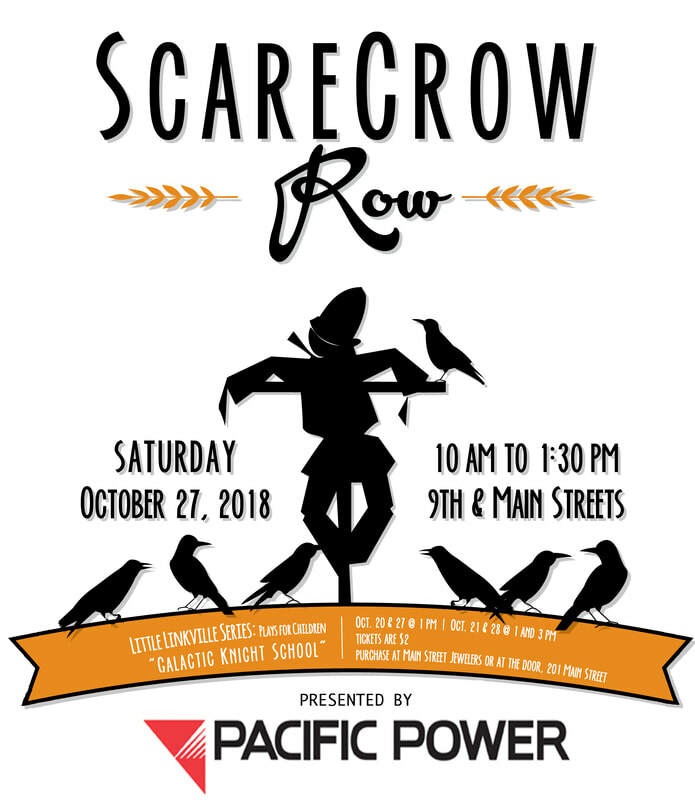 We hope you are as excited about Scarecrow Row as we are! Please make note of the following information to ensure everyone has a safe, enjoyable time! If you want to participate in the costume parade, meet at 9th & Main at 10:00am. The parade will start around 10:15am starting at 9th & Main, and ending at 4th & Main. After the parade, attendees are welcome to trick or treat on Main Street until 11:30am. See the map below for participating businesses and a suggested route. After trick or treating, come back to the Farmers Market! Local producers will be available, and there will be several Scarecrow Row activities for kids! Main Street will be closed between 10th Street and 4th Street from 9:45am to noon to accommodate the costume parade and trick or treating. Scarecrow Row attendees should be cautious at all times when crossing the street, leaving sidewalks, etc. Parents should remain with their children at all times. Officers and Explorers from the Klamath Falls Police Department will be on hand at the event, as will event volunteers (look for the yellow KFDA vests). Restrooms (including accessible units) will be available for public use at Farmers Market (9th & Main) and at Sugarman's Corner (6th & Main). Please make sure to keep downtown looking terrific! Waste receptacles are located generously on Main St. If there are any questions or problems, please contact KFDA at 541-539-6212. A map of activities is below! Click the menu hide/unhide button at top left to see a legend. Click the enlarge button at top right to open the full map in Google. To open the map in Google directly, click here.